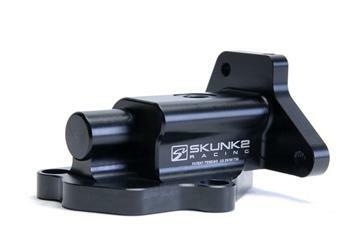 Skunk2 is proud to introduce its all-new Billet VTEC Solenoid for Honda’s B-series VTEC engines. The first of its kind, Skunk2’s Billet VTEC Solenoid is designed to be used with any B16A/B or B18C cylinder head and is compatible with Honda’s original pressure sensor, solenoid internals, and gasket. Manufactured from 6061-T6 billet aluminum and hard anodized for durability, Skunk2 employs the same design and manufacturing methods for all of its Fine Tuning accessories as it does for its top-of-the-line racing components. Each Billet VTEC Solenoid includes flush-mounted hardware and a smooth, machined body for an attractive look.